The BNC facility comprises one of the largest and cleanest university cleanrooms in the world. The nanofabrication cleanroom consists of 25,000 sq. ft. of bay-chase cleanroom, with 45% of the bays operating at ISO 3 (Class 1), 40% operating at ISO 4 (Class 10), and the remaining 15% operating at ISO 5 (Class 100). The three-level structure consists of a full subfab, the cleanroom level, and an air-handling level above the cleanroom. A perforated raised floor ensures unidirectional airflow and bulkhead-mounted equipment separates operational functions from maintenance functions. A combination of careful control of the airflow path, multiple stages of filtration, careful choice of materials, and non-ionic-steam humidification ensure the control of both particulate and molecular contamination. A very tight waffle slab provides NIST A vibration rating, approximating quiet, slab-on-grade construction. Lithographic capability spans the nano and micro scale, with the capability of integrating nanoscale structures within micro-scale devices. A Vistec VectorBeam VB-6 UHR-UWF electron-beam lithography system provides the capability of 6 nanometer lines in resist across a 1.3 mm field and a Raith e-beam nanolithography system provides 20 nanometer resolution. An interference lithography system provides 100 nanometer resolution for less-critical operations. A nanoimprint-lithography tool replicates images created on the e-beam lithography system. Optical lithography is used in many operations in BNC, and is supported by a maskmaking operation and single- and double-sided mask alignment. A Heidelberg laser maskmaking system and a 5x Criss-Cross Pattern Generator/Step-and-Repeat system, coupled with specialized image-reversal systems, provide a variety of photomasks to support research efforts. Wet- and dry-etch capabilities allow the etching at high aspect ratios in a variety of materials. Three STS Deep Reactive Ion Etch (DRIE) systems, a Panasonic chlorine-fluorine DRIE, a xenon difluoride etcher, and an Oxford PlasmaTech system anchor the dry-etching capabilities. A Branson asher removes photoresist by use of an oxygen plasma. Several conventional acid and solvent hoods, as well as two high-temperature-acid hoods, provide space for wet etches and cleans. Physical vapor deposition is a strength in the BNC. Eight evaporators and four sputterers allow the deposition of more than 24 different materials. Additionally, plasma-enhanced deposition systems and an LPCVD system provide further capabilities. Of special interest are four atomic-layer-deposition (ALD) systems designed especially for high-integrity high-k dielectric films. Three three-tube banks of process furnaces include clean (i.e., gate) oxidation, drive, LTO, and LPCVD capabilities. This is supplemented by a separate two-tube pyrogenic oxidation system and several smaller high-temperature tubes and lower-temperature annealing tubes. Low temperature annealing and activation can be performed on three rapid-thermal-processing systems. The ultra-pure water (UPW) system at BNC supplies all laboratories and the cleanroom with incredibly pure water. Termed nano-grade water, this water is below the measurement limits of 15 parts per trillion of boron, the ion most loosely bound to the mixed beds and therefore the most likely ionic impurity in the water. This water also contains less than 225 parts per trillion of total oxidizable carbon (TOC) and less than 1 part per billion of dissolved oxygen. Integrated into the Scifres Nanofabrication Laboratory is a pharmaceutical-grade cleanroom to allow sterile processing. This cleanroom is entered through a separate gowning room and has a completely separate air-handling system, but has a pass-through to the nanofabrication cleanroom to allow materials to be transferred into this facility without breaking cleanliness. Designed for sanitization, it trades a perforated floor for coved sheet-vinyl flooring and boasts a special pharmaceutical wall and ceiling system. 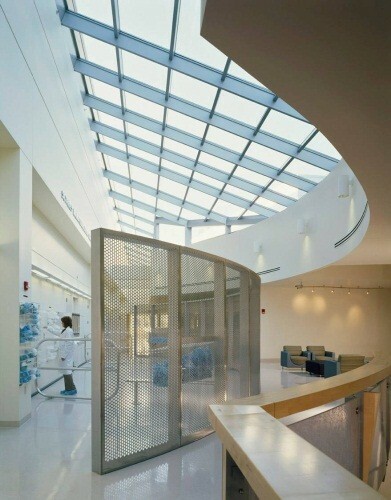 Outside the entrance to the biocleanroom is an enclosed overhead walkway to Bindley Bioscience Center.